Roofing is synonymous with fall protection and prevention, in both commercial and residential work. The dangers of injury or death on any jobsite are apparent, and waiting until the unthinkable happens is just not an option. Protect your crews and your reputation, and avoid costly safety fines by providing the proper equipment. Crews easily get caught up focusing on the tasks for the roofing job, and not paying attention to the perimeter itself and the dangers that lie below. By putting a barrier system in place, your crews can continue working and are alerted when they come close to perimeter and prevented from falling. 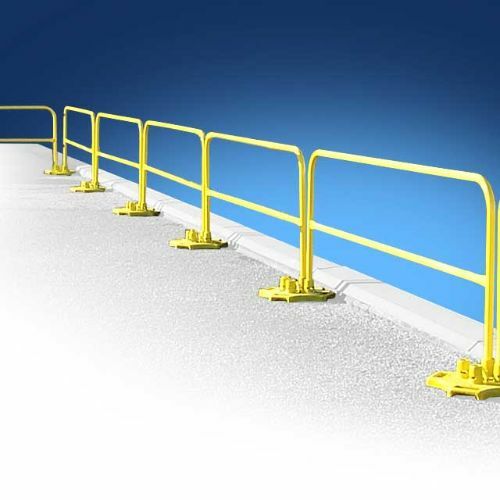 The S00065 10 foot guard rail section is part of the full barrier system by Cleasby, which also includes 5 and 8 foot sections of guard rail as well as the base plates and even a transport cart for the base plates. Order only the pieces you need to provide enough guard rail for the working area, and the base plates to support the system. Set up is simple with this barrier system as well, in just minutes the rails can be pinned to the baseplates and all necessary hardware is included. The full system will hold up against 200 pounds of weight when manufacturer instructions are followed during assembly. Using the transport cart, base plates can be moved as the job progresses without unnecessary manual strain. This means protection for your crews, and easy mobility without needing to purchase multiple systems. Order part or all of the Cleasby Fall Prevention barrier system today at Intech Equipment and Supply! For information on recommended quantities and more, contact our pros for assistance. Our experience coupled with over 60 years of resources and manufacturing experience at Cleasby will help you ensure you make the right selections the first time around!